How does a Catholic girl get mistaken for being Jewish? Marry into a name. A conundrum, to be sure. While my husband would have us all remain happily ignorant of his heritage, it’s not easy in a world where rabbis and real-estate agents want to pin stars on the rest of us. So rather than fight the stereotype and protest the label, I’ve decided to learn about the Jew in us. Mix matzo ball ingredients in a bowl. Refrigerate for about 20 minutes. Bring a pot of salted water to boil. With wet hands, shape matzo into 1-inch balls and drop into simmering water. Cover the pot and cook for 40 minutes. About 10 minutes before the matzo balls are cooked, heat the chicken stock and carrot. (If you’ve made the matzo balls ahead of time, add them to the stock and bring the whole thing to a simmer.) 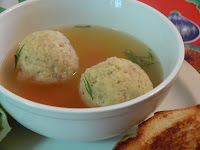 Ladle soup and a couple matzo balls into a bowl, garnish with dill.